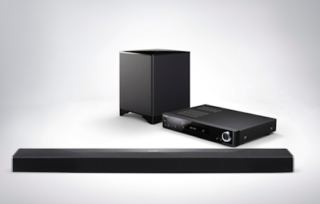 Onkyo announces Atmos and DTS:X soundbar system | What Hi-Fi? Onkyo's new soundbar, the LS7200, is a 53mm tall system that allows both Dolby Atmos and DTS:X playback. The LS7200 has the ability, it is claimed, to upmix multichannel audio to 3D sound, using 'Surround Enhancer' technology to create "virtual rear speakers". This creates the illusion of having sound coming from behind you, without the need for physical speakers, by the interpolation of how sound would bounce off the walls and ceiling. Connecting via a cable to a separate 'AV Center' control unit, the LS7200 has two speakers each for the left, right, and centre channels, and connects wirelessly to a subwoofer. The AV centre has four HDMI inputs, at least one of which is HDCP 2:2 compatible to allow viewing in 4K. It can play music through 'DTS Play-Fi', a free app for iOS and Android, or through Apple's Airplay, Tidal, and Spotify Connect. It also has a 40-preset FM tuner, an AV sync function, and L/R tone controls. The LS7200 will cost £900 and is due in the shops in January 2017.